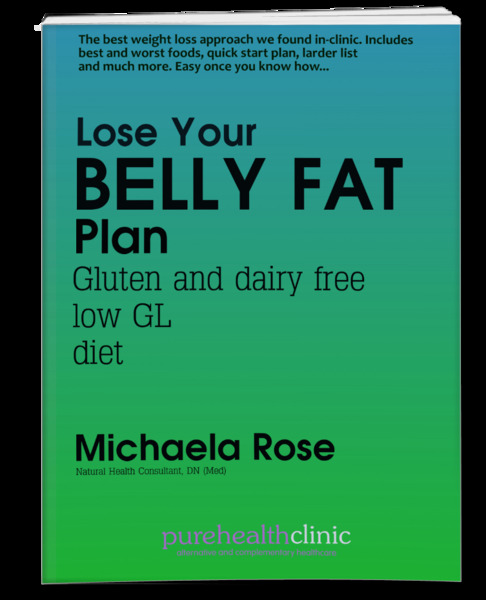 This 30 page ebook helps explains why you might benefit from and how to implement a low GL (glycaemic load) gluten and dairy free eating plan. This plan is based on what worked in-clinic for stubborn weight loss patients, as well as those who had constant water retention and/or bloating. People vastly under-estimate the effect food sensitivity, especially to the common gluten and dairy, can have on weight and the ability to shift it. On top of that, most people who hold fat around their bellies are not balancing their insulin very well. To put that right and stop producing so much of the so-called 'fat hormone', you need to follow a higher protein, lower carb diet. This used to be a low GI (glycaemic index) diet, but is now much more about the total load of the diet rather than each individual food, hence GL (glycaemic load). Note: I also regularly recommend this book for people needing a gluten and dairy free diet. I simply haven't had chance to take out the weight loss references etc yet, but all the meal plans and diet info is in there for you. This also includes a quick reference guide on the best and worst GL foods, a quick start plan, a larder list, loads of recipe and meal ideas and much more..
Quick Summary: What is this diet? Best & Worst Foods: Stick this on your fridge and in your handbag! Hope it helps; it usually does!